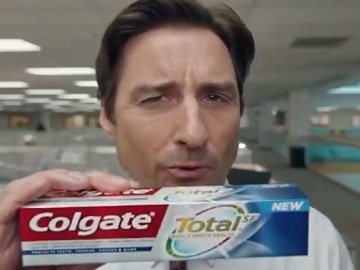 Colgate has released its Super Bowl LIII ad, featuring Luke Wilson as a close talker. The spot features the actor in an office building approaching supposed co-workers and talking right into their face because he uses Colgate Total toothpaste. “I’a close talker so I was excited about all new Colgate Total,” Wilson says, showing the toothpaste to the camera and adding that “its breakthrough formula does more”, from dealing with sensitivity, to strengthening teeth, and killing germs through his whole mouth. “Now there’s no such thing as too close,” he also says as he backpedals while walking and talking in front of a delivery guy, who contradicts him. Created by agency Red Fuse Communications and directed by Bryan Buckley, Colgate’s spot for SB LII, carrying the tagline “Do More For Your Mouth,” is set to air during the third quarter’s second commercial break.